hmmm….excellent photographer and knitter? whom could it be? someone in the brooklyn area perhaps…. Hooray! There seem to be a lot of babies in the near future for friends and family – now they can have great elven hats. Thanks for the link and the translation action. Yay the baby hat! Okay, so I did it differently, but only slightly. I just used different methods of increasing and decreasing. 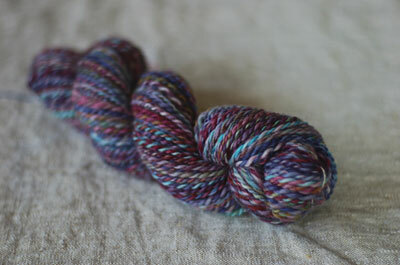 i just ordered one of your spindle kits so hopefully someday i can make yarn as lovely as that. About how much handspun did you use for the baby surprise jacket (yardage)? I’m thinking of using this month’s fiber club selection for one and wondered how much I’d need to add to it. TIA! 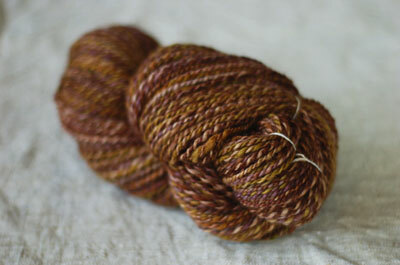 it’s interesting how in the pluot color, the brown so predominates in the spun up yarn. but it doesn’t necessarily in the fiber. Yummy handspun and I just can’t wait 1) to see your finished hat and 2) make one up myself. Thanks for linking the pattern in English. It would be the perfect thing to cast on tomorrow on Norway’s independence day, but that probably won’t really happen. I’m excited to have a new baby hat pattern. Thank you for posting the link. Any chance you have any of the herbal colorway left or are willing to make me some? I must be a good week for gorgeous handspun. Droool. Thanks for the word on the fab new baby hat. I’ll be the first on my block to knit one (I’m preggo and due in three weeks–perfetto). I love the yarn you used too. 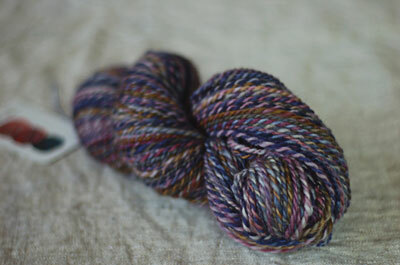 What gorgeous handspun you have! I cannot wait to get the fiber I ordered from your shop!! Your yarn is lovely. Right now I do not have any babies coming into my family but I think I am going to have to knit some of those adorable hats to have just in case. Really, really cute. Thank you for chasing down the pattern, finding a translator, and linking to it! Yay!! I love this hat! 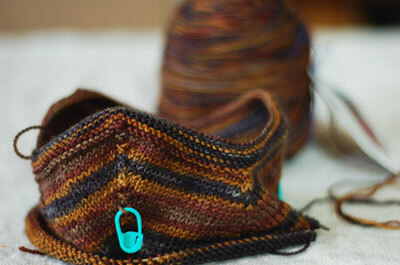 And I love this month’s club fiber–the colors balance each other so beautifully! gorgeous rich colors! lovely yarns. mystery new home for them. ooh. love mysteries… wonder what they’ll be when they grow up. Great color, and very nice baby hat! I knit one also for my son! Awesome. I emailed a woman I know in Norway to see if she could translate the pattern for me but you beat me to the punch! Now I just need to find a baby. very pretty yarn! Love the baby hat, very cute! Thanks for making it available. Thank you for the link to the English translation, I saw your cute hat first and I was glad to hear a translation might be put up soon. Adorable! Could this pattern be knitted on two needles and then joined?